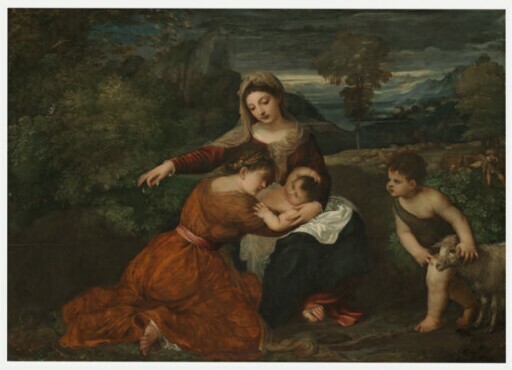 More than any other Renaissance master, Titian was acclaimed—in his own lifetime and for centuries thereafter—for his expressive handling of paint and rich use of color. Like his teachers Giovanni Bellini and Giorgione, Titian set many of his religious subjects in a pastoral landscape. The Kimbell panel is closely related to a version of the same composition in the National Gallery, London. In both works Mary cradles the Christ Child, who is embraced by a kneeling female saint. Various aspects of the Kimbell painting underscore the devotional theme of Christ’s impending sacrifice. Christ’s chubby arm is curled over his head in a pose used since antiquity to denote sleep as well as death. The white cloth that sets off his plump form foreshadows his shroud and also recalls the cloth traditionally used to protect the host during the Mass. X-radiography reveals that, as in the London version, Titian initially painted a figure at the left (an angel in the Kimbell version) offering flowers to the Virgin. The artist later painted over this figure with a thicket and a finch, a symbol of Christ’s Passion. Giving further emphasis to this sacrificial message, Titian also introduced the infant Saint John the Baptist gently leading a lamb. Whereas the London version is on canvas, the Kimbell painting is on panel, which results in more deeply saturated color. Some areas—such as the sky, the Virgin’s mantle, and the saint’s dress—have darkened in color and become more transparent with age. As is frequently found in Italian paintings of the Renaissance, certain irreversible pigment changes have occurred in Titian's Madonna and Child with a Female Saint and the Infant Saint John the Baptist. The luminous green of copper resinate glazes has turned brown where it was thinly painted, such as in the tree that is silhouetted against the sky. The azurite blue of the sky and the Madonna’s robe, as well as the brilliant orange realgar glazes used for the drapery of the female saint, have also undergone chemical alterations causing them to appear darkened. Together these changes give the painting an autumnal mood, which was most likely not the artist’s original intention. Various pentimenti are clearly visible in the x-radiograph, while some remain visible to the naked eye due to the increased transparency of oil paint with age. For example, the female saint’s eye was positioned lower, and the Christ child’s proper left arm was placed further to the left on her shoulder. The figure of Saint John was painted on top of the already completed shrubbery, and these dark tones can be seen through the cracks in the flesh tones. Drying cracks can often be seen in Titian’s panel paintings, such as in the Nativity in the Pitti Palace, Florence. This type of cracking is an example of “inherent vice,” or a problem due to the artist’s technique. It occurs when upper layers of paint are applied before the lower layers have dried sufficiently. Possibly Mr. V. Joseph, London. purchased for £78-15 by (Francesco Pospisil, Venice). Private collection, Bologna, by 1969.
purchased by Kimbell Art Foundation, Fort Worth, 1986.